Uncover the history of our nation through the United States History Teacher's Edition, a comprehensive survey rich in Christian insight. 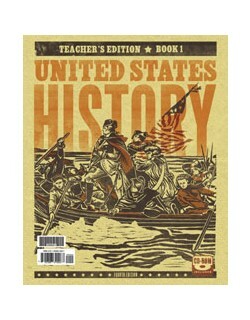 The book focuses on the causes of events, forces, and people that have shaped United States history. The Teacher's Edition (2 volumes) provides reduced student pages, lesson plan overviews, supplemental content, and ideas for additional activities. The CD includes additional maps, documents, photos, and more.